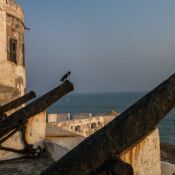 Cannon on the ramparts of Cape Coast Castle, Ghana. Hyangwonjeong Pavilion in the grounds of the Gyeongbokgung Palace Complex, the seat of the Joseon dynasty of Korean royalty, in Seoul. 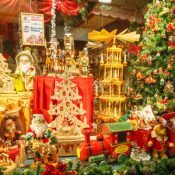 A Christmas display in a Bruges shop window. 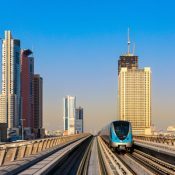 A train pulls away from a station on the Dubai Metro, the Arabian Peninsula's first rapid transit rail network.